WHAT: The zombie craze continues. These guys are new figures I found the other day at the dollar store that, like S.L.U.G. Zombies, Z.O.M.B.I.E. 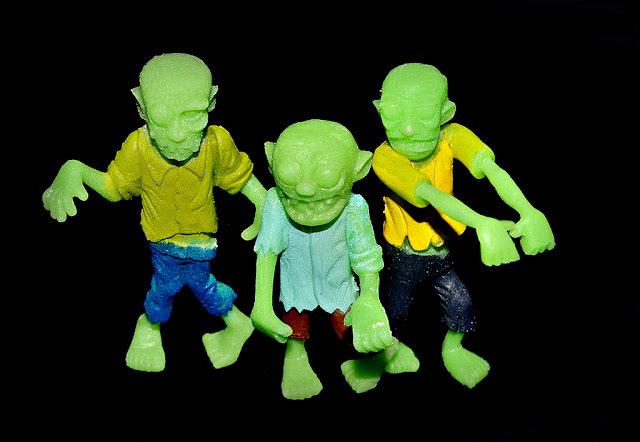 and Zombie Planet, take advantage of the current popularity of zombies in toy form. They are a bit taller than S.L.U.G.s and glow in the dark. Unfortunately, they also have the "put them in water and then grow" gimmick, which would be fine except that means they're made out of that funky, totally not durable grow material. That's why I got a set to open and a set to keep sealed (totally worth doing at only $1 each). I actually really like the looks of these things. The sculpts are fun and that glow green color of their skin is pretty cool. 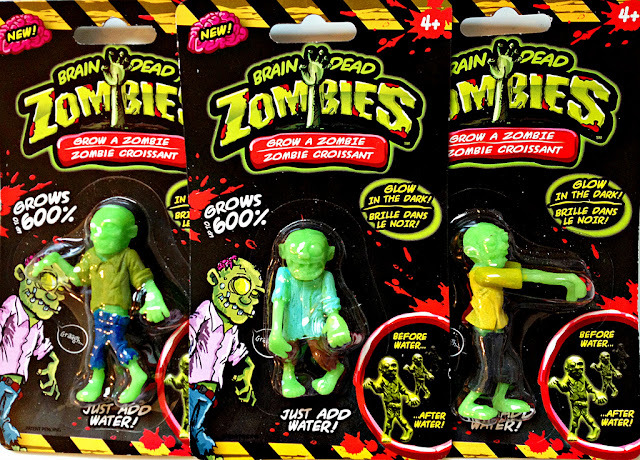 My favorite zombie is the guy in the middle with the huge head and mouth. He just looks so demented. WHEN: I bought them in May 2013. WHERE: Found at Dollar Tree, a chain of North American discount stores. WHO: Alley Oop, LLC/Inspirefly Toys, LLC. They are shown as one of the products at inspireflytoys.com.